11/82 Kelly Metz Not the greatest movie of the year or anything, but it gets major points for the heartwarming story and great performance by Bullock. She and McGraw played well off each other. 41/169 Max Braden This isn't quite Erin Brockovich. It's too overt, and Bullock is too stiff. Michael Oher has lived both a cursed life and a blessed one. Born one of 13 children of a crack addict, most of Oher's youth was spent avoiding foster homes. He was placed in them several times, but he always managed to run away, returning to the odd comfort of his mother's home. By his own account, his mother was not mean to him. She told all of her children how much she loved them on a frequent basis. Still, at the start of each month, she would receive a check from the federal government to pay for the raising of her family. At this point, Mama Oher would head straight to a drug den to spend her money. The kids might not see her for ten days after that. It was a hard life for a child, truly Dickensian in nature. Oher's life changed in a profound way when he made friends with a gentleman called Big Tony, whose son had been taken out of his West Memphis high school. Big Tony wanted a better life for his son, and that meant attending private school in East Memphis, the white side of town. On a whim the man later admitted had no logic to it, Big Tony decided to take the boy known as Big Mike along to Briarcrest Christian School. The plan was to help this struggling 16-year-old out by having him matriculate at a prestigious school with a fine athletic program. The plan had flaws. Big Mike had no money with which to pay for the extremely expensive private school. Even if he were able to find a workaround for this, Oher had another problem. He had no educational background. The boy had been passed along from grade to grade, exploiting a known problem with inner city academic programs in the public school system. Many teachers simply pass students rather than bother to risk government funding by acknowledging how many of the kids were illiterate. Michael Oher was not exactly illiterate. He was what The Blind Side author Michael Lewis would describe as a blank slate. Oher had no real education in his life. Even when he had been enrolled in school, he had played hooky 40 or more days each of those years. He had somehow managed to fall through the cracks enough that he had never truly learned anything save how to survive a brutal upbringing. The only testing done on him indicated he was in the ninth percentile of intelligence quotient. This was inaccurate. Big Mike had a unique ability to learn from watching others. In the educational system, book learning was not his strong suit. The entire lexicon of the English language was an unknown to him. So, reading text did not afford him the opportunity to learn. Only through visualization could he achieve knowledge, and this was not the practice of the public school classrooms. In a chilling turn of events, this boy had learned absolutely nothing in his educational career. He was not incapable of learning, as the teachers at Greenbriar would soon realize. He simply did not function the same way that the system requires of its students. And even if Michael Oher could get a free education from a nice school for which he had no business qualifying academically due to his lack of knowledge, he had two other problems. The first was that unlike his public school system, the private one would not provide free meals to its students. The boy had no way to pay for his food. The other was that his best hope of earning his place at Briarcrest would be through sports. There was just one problem. This boy was called Big Mike because he was six feet five inches, and weighed 344 pounds. And he considered his primary sport to be basketball with his natural position as shooting guard. There were any number of reasons why this boy from a tragic background should have remained permanently lost in the shuffle. The kindness of strangers prevented this from occurring. First, a man almost as large as the boy saw him and empathized with the boy's plight. Big Tony brought Big Mike to Briarcrest and said, "Can you give this child a chance?" There was every reason in the world to say no, but football coach Hugh Freeze was coming off a state championship. He had pull with the administration, and he asked the principal to look at this boy as an opportunity to do something right. Steve Simpson, the principal, had no academic justification to make this decision, and so he said no...with a caveat. He promised the boy that if he completed some course work in time, he could enroll for the winter semester. What Steve Simpson learned about Michael Oher is that the boy should not be underestimated. He did as instructed, albeit not enough to meet the demands of Simpson. This left the educator in an awkward position. He realized too late he had given the boy false hope. The principal was compelled to give the boy a chance, and thus began the private education of the 340 pound would-be guard. Fate had one more favor owed to the mammoth 16-year-old for his past indignities. It aligned all of the cards such that Big Mike would have no choice but to meet the most famous point guard attached to Briarcrest, Sean Tuohy. The current broadcaster for the Memphis Grizzlies, Tuohy made a name for himself in the early 1980s when he shattered every major SEC assists-related record while playing for Ole Miss. After a brief NBA career, Tuohy became an entrepeneur, buying 85 fast food restaurant franchises such as Taco Bell and Long John Silver's. He also had a daughter and a son along the way. Sean Tuohy Jr. was only eight at the time, but Collins Tuohy, a soon-to-be state champion track star, was the same age as Mike Oher. She went to Briarcrest and her father, Sean, started volunteer coaching the basketball and football teams. He also set up a system whereby any of the poor kids who couldn't afford lunch would have their meals paid for on his dime. Sean Tuohy might seem to be totally different from Mike Oher, but they were in reality kindred spirits. Tuohy had grown up in a poor area, and it was only his excellence in sports that led him to his later financial successes. When he eventually encountered the boy whose meals had been paid for by Tuohy, he discovered the young man was not...friendly. So guarded was Oher about his past that he was in the habit of offering colorless one word answers when quizzed about his past. Tuohy wished him well, thought about how odd the boy was and moved on. That could have been the end of their contact if fate had not intervened once more. While driving with wife Leigh Anne, Sean saw the boy walking down the street to Briarcrest's gym over Thanksgiving break. He asked the boy why, and eventually came to realize Mike Oher was going somewhere warm to protect himself from the cold. He thought the idea of it was tragic, but the impact on Leigh Anne Tuohy was much more profound. Reduced to tears, she decided at that moment that Oher was to become part of her family temporarily, long enough for him to find his way in life. Several years later, Michael Oher is in the will of Sean and Leigh Anne Tuohy. It's what parents do for their children. In the interim, Leigh Anne helped Big Mike (sidenote: he hates that nickname since shooting guards are not supposed to be big) not only survive in high school but excel. She diligently worked with him to find methodology through which he could learn the theories being taught at the private school . Along the way, he raised his GPA from a 0.6 (yes, 0.6) to the NCAA-required 2.65 needed for athletes to be college-eligible as freshmen. This is important because there was one other major change in Oher's life. After enjoying his time on the basketball team, Michael Oher moonlighted as a football player. He didn't take much of an interest in the sport since his hero and inspiration, Michael Jordan, hadn't played it. Once word got out about the 340 pound man ("light for a cow" said the man with the only scale that could accurately measure Oher's weight) with the athleticism of a person half his size, a shooting guard's agility if you will, college football coaches started salivating at the idea of the boy playing offensive line for them. In the NFL, the highest paid position will always be quarterback, but the second highest paid position is left tackle. Michael Oher was the rarest of rare high school specimen, a true left tackle. 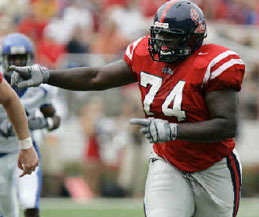 In a period of two short years, Oher went from being a football neophyte to a first team All-American offensive tackle and among the most desired college football prospects in a 2004 class that included Brian Brohm, Adrian Peterson and Tedd Ginn, the latter two of whom were top ten draft picks in 2007. Due to his meteoric rise to prominence in college athletics, the legend of Michael Oher became a big deal to those covering the story. He progressed from the destitute fat kid with no future to the best offensive line prospect in the high school game. As national championship-winning head coaches such as Nick Saban and Phil Fulmer fell all over themselves in order to recruit Oher, the governing body of college football, the NCAA, suddenly looked up and realized that Ole Miss had acquired the best lineman in football while he was living in the house of one of the most prominent boosters of the university. They couldn't even count the number of recruiting improprieties that had occurred in this regard. What the institution could not wrap its head around was that Big Mike had not received benefits from a booster. He had become a member of the Tuohy family, a child named in their multi-million dollar will. Sure, the college legislative body couldn't help themselves, bungling into the situation while threatening punishment and repercussions for this action. They could not see what was right in front of them: the amazing life journey taken by Oher as he started out with nothing then wound up living the life of the children of the Memphis elite on his way to becoming a first round NFL draft pick. All of the above sounds like what it is, an amazing series of events creating context for one of the best true life tales of our generation. The Blind Side is one of the best sports books of the 2000s, and Fox has realized this amazing story of racial and financial integration of polar opposites for the engrossing subject it is. Within days of the Michael Lewis novel's release, soon after the publication of an abridged version in New York Times Magazine entitled The Ballad of Big Mike, the studio had acquired the rights to make the best true life football movie concept since Remember the Titans. See the latest developments for this project on the The Blind Side Movie News page.